Confirmed by Dave Birkett of the Detroit Free Press, the Detroit Lions have signed free agent defensive lineman Datone Jones to the active roster. In a rotational role, Jones had been a solid player for Green Bay the past three seasons and has experience playing both on the interior and on the edge, bringing the positional versatility the Lions look for in their defensive linemen. 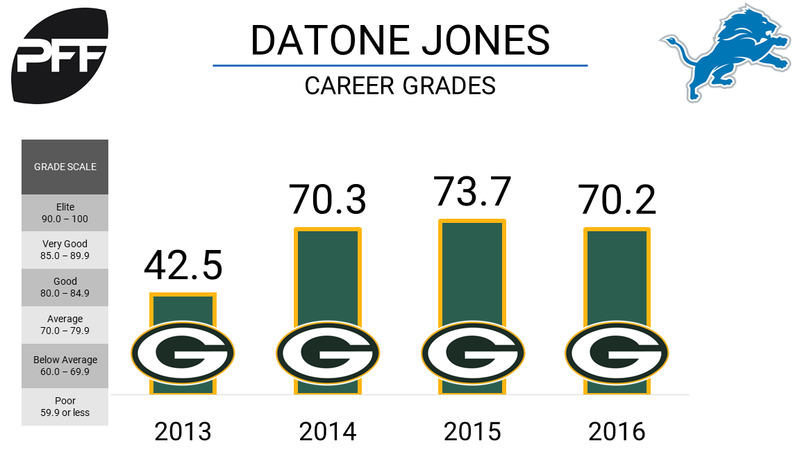 In 2016, Jones played primarily on the edge for the Packers, starting four games and earning an overall grade of 70.2 on 635 snaps. He was most productive on the edge as a run stopper, producing the 10th highest run-stop percentage among 3-4 OLBs at 8.4 percent. He did produce 34 total pressures while rushing the passer but only converted one into a sack. Playing mostly on the interior in 2015, Jones earned an overall grade of 73.7. Used primarily as a pass-rusher, Jones produced the ninth highest pass-rush productivity among 3-4 defensive ends at 9.9. In limited snaps versus the run that season he ranked third in run-stop percentage at 13.2 percent among interior defenders that defended the run on at least 75 snaps. Jones will join a Lions defensive line this season that has been solid overall with each of their top-7 primary players grading at 70.0 or above.